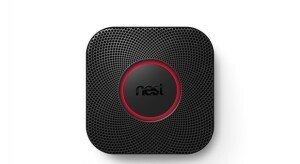 NEST, famous for their smart thermostats (of which I have two) today unveiled a reimagined, web-enabled smoke alarm, and while it’s certainly cool-looking, it left me wondering, “What’s the point?” Why would anyone need a $130 smoke detector (link to where it’s sold)? Is it really worth it? And remember, this is coming from the guy with the health-tracking wristband, iPhone cleaning tie, and iPhone-charging backpack. Has the time finally come where our phones will be the first to tell us our house is on fire? Heating, air conditioning, and climate control constantly require attention. Between balancing staying comfortable, and saving money, the ability to access the thermostat from anywhere, to monitor patterns and cost-saving opportunities, and to automatically adjust to those opportunities, the NEST is well worth it, even at $200 a pop. But how could the same possibly apply to a smoke detector? I mean, if your home is smoking enough that you need to monitor it constantly on the go, either you burn a lot of toast, or you’ve got bigger problems. Considering the fact that smoke detectors can be found for as little as $7, $130 seems a bit steep for a device which you may interact with once or twice a year, depending upon just how unlucky you are. And For $130, does the Protect offer LESS Protection? Perhaps most surprisingly, the NEST offers only photoelectric monitoring, not the more reliable, more expensive ionization monitoring. Basically, it monitors for change in light. As one of the most expensive detectors on the market by-far, I found this a bit shocking, and mildly disappointing. On the positive end, it also has a heat sensor, and a carbon monoxide sensor. P.S. If you don’t have a CO (carbon monoxide) detector, get one now. Many municipalities even offer them for free, and they may save your life. Another positive is an improved battery-backup and alert system, replacing that incredibly annoying chirp that we all love to hate. But, with a more sophisticated system, is there more room for error? Most smoke alarms are simple, but effective circuitry. The simplicity leaves minimal points of failure. Introducing a computer system with the power to control alarms, autonomous decisionmaking, and a much more complicated design means that points for failure increase drastically. I’m sure that NEST has tested the Protect thoroughly, but I can’t help wondering whether all of this added complexity is really to my benefit. Don’t take this article as my saying not to purchase a NEST Protect. I’m merely asking a question that needs to be asked. I’m confident that the NEST Protect is safe, and I’m confident that it would be more enjoyable, and perhaps even more helpful than a regular smoke alarm. I just had to ask if we really need this, and what a smart smoke alarm like the Protect actually means.